CINCINNATI -- The resurgence of Madisonville isn't news to developers pouring money into the historic neighborhood and especially not to new and old residents who have turned around a decades-long population dip. 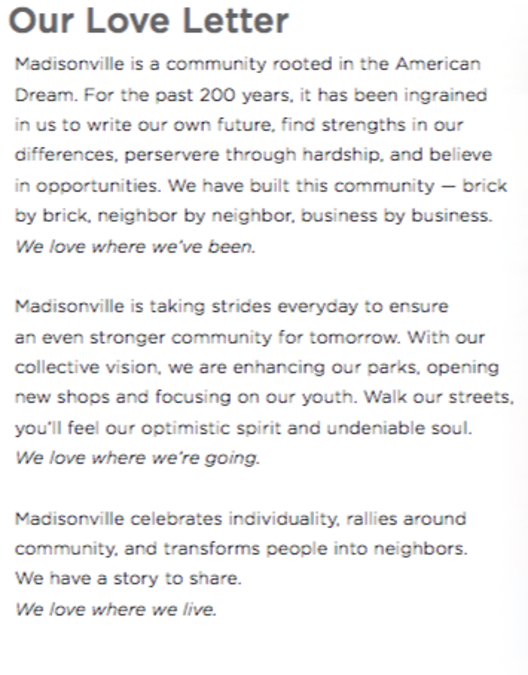 But for those still unaware of Madisonville's rising fortunes, the neighborhood has taken the rare step of creating a sleek branding campaign for itself through a $40,000 grant from Local Initiatives Support Corporation, or LISC, a national organization that helps neighborhoods revitalize. A logo, a catchphrase -- "Soul of Our City" -- and color scheme roll out June 3 with a community celebration that Sara Sheets, executive director of Madisonville's redevelopment corporation, promises is just the beginning of a cohesive campaign. "We think there's a lot of potential to retell Madisonville's story," Sheets said. Sheets hopes to raise an additional $50,000 to $100,000 from private donors and grants to execute the campaign in style, including distinctive sculptures and signage at each major entry point into the neighborhood and signage directing people to key attractions. Proposed branding at Madisonville's recreation center. Themes and variations on Madisonville's new logo. Madisonville, which was settled by European-Americans in 1797, has an impressive comeback story to tell after decades of sinking fortunes as residents left for the suburbs. The neighborhood near Cincinnati's eastern border has seen its population dive from a peak of 19,000 in 1970 to about 10,000 in the 2010 census. But that steep decline is reversing through a concerted effort of Cincinnati buying up property for redevelopment, Medpace building and expanding its headquarters there and residents bonding over community activities like swapping seeds for backyard vegetable gardens and creating a thriving urban chicken coop movement. 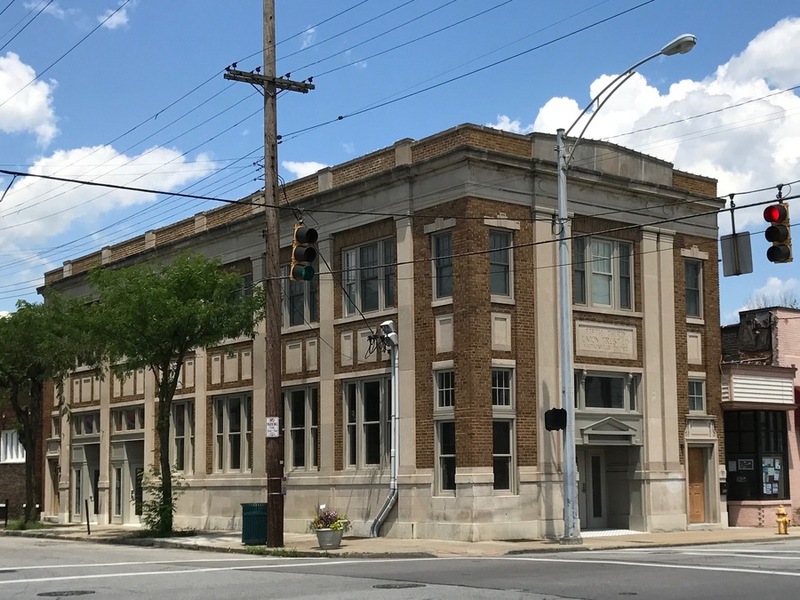 The neighborhood saw 10 new businesses open in 2016, and excitement is building around Bad Tom Smith Brewery signing a letter of intent to move its craft brewery and tap room into a grand old Fifth Third Bank building on the northeast corner Madison and Whetsel. That's on top of a raft of apartment and hotel development, including Ackerman Group's plan to build new apartments on Madison Road in the heart of the old business district that will be geared toward people making $45,000 to $55,000 a year. One-half mile down the road, Medpace is anchoring a dramatic expansion of commerce along Red Bank Road that will soon include a conference center, a Dolce Hotel and a Holiday Inn Express. That half-mile stretch seems longer to some than it is because of the distinct change in atmosphere between the quaint, low-rise buildings of the old business district and the larger, contemporary scale of Medpace's headquarters and businesses rising around it. "It feels like a big gulf, but when you realize how close the two centers are it shouldn't feel that far," said Matt Strauss, Madisonville Community Urban Redevelopment Corporation's real estate and marketing manager. 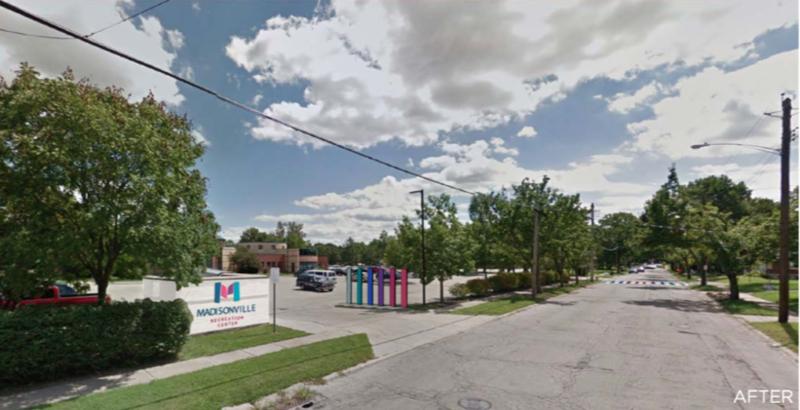 The group intends to close that gap between neighborhood centers with branded signs inviting Medpace employees and conference center guests to stroll or shuttle up to the business district. And signs encouraging residents near the old business district to venture down to restaurants and bars near Medpace. That marketing will be coupled with safer sidewalks, roads and crossings to make the span more walk-able and bike-able. Sheets is proud that the plan, assembled by Cincinnati's Kolar Design, included a lot of input from old and new residents, old and new business owners and a range of interested people. Their input influenced a "love letter" that's part of Kolar's plan. "'We love where we've been' is a really important aspect. People don't want to lose what they have," Sheets said. Saturday's rollout party will include wooden stencils for children and adults to use to chalk the logo onto the street, T-shirt sales, temporary logo tattoos and giveaways. Bob Driehaus covers economic development. Contact him and follow stories on Facebook , Google , and Twitter .